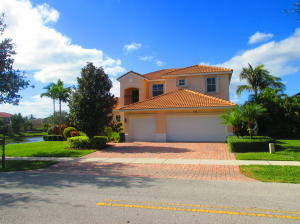 134 Magnolia Way Tequesta, Fl 33469 has been sold. You can view available homes in Riverside Oaks. RIVERSIDE OAKS THE MOST DESIRABLE TEQUESTA NEIGHBORHOOD....ENJOY SPECTACULAR SUNSETS OVER LOOKING THIS WATERFRONT LOT, THIS 4BR/3.5BA CBS BUILT HOME IS IN EXCELLENT CONDITION AND READY TO MOVE IN. THIS WELL CARED FOR HOME HAS ALL NEW SS APPLIANCES, AND GRANITE COUNTERTOPS, NEW WASHER/DRYER, NEW CARPET IN ALL BEDROOMS AND HOME HAS BEEN PROFESSIONALLY PAINTED INSIDE AND OUT. SPACIOUS 3 CAR GARAGE WITH BRICK PAVERS THROUGHOUT THE PROPERTY. POOL & SPA HAS NEWER HEAT PUMP FOR THE WINTERS AND IS GREAT FOR ENTERTAINING. 134 Magnolia Way located in Tequesta, FL is a single family home with 4 bedrooms, 3 full baths and 1 half baths.The Home at 134 Magnolia Way was built in 2004 in Riverside Oaks and offers a 3 car garage. This Riverside Oaks Home offers sidewalk, street lights. 134 Magnolia Way Tequesta, Fl is currently listed for $589,000 under the MLS# RX-10416960. This Home has been put on the Tequesta MLS system and currently has a status of SLD. Riverside Oaks in Tequesta is really a wonderful community in a great city. If you like the beautiful Tequesta location but you are not sure about this community. You might like one of the other local communities like Little Club or La Mar or Beach Sound or Shady Lane or The Carlyle that are located here. Information in regards to Tequesta real estate and Riverside Oaks Homes for sale or any other areas may have come from a cooperative data exchange service. All rights reserved. Information deemed to be reliable but not guaranteed. The data relating to real estate for sale on this website comes in part from the IDX Program of the Florida Regional MLS. Listing broker has attempted to offer accurate data, but buyers are advised to confirm all items. We provide all information about Tequesta Homes for sale and Riverside Oaks real estate and all other site listings as is with absolutely no warranties. This site will be monitored for 'scraping' and any use of search facilities of data on the site other than by a consumer looking to purchase real estate, is prohibited. Feel free to contact our agents to find a great Riverside Oaks Tequesta specialist.